Hello Lovelies! It's been a long time since I've written my last Shop the Trend post, so today I've decided to talk about Paisley print which has its origins in India and it takes its name from Paisley, a Scottish city where this print was imported in the 19th century. It was in vogue especially during 60s, then it started to appear only on men's ties. It has become more popular in the last months; now we can find it on shirts, skirts, dresses, shoes and bikinis. 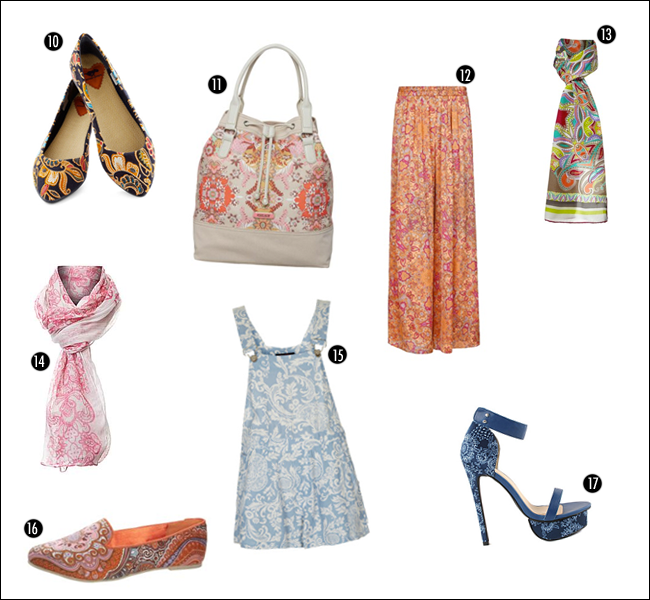 It's a fresh, funny print that if well paired, it gives the look a really boho-chic twist. It's reccomended to stay neutral with the other garments (unless we want to look like our grandma's curtains) and not to exaggerate with the accessories. 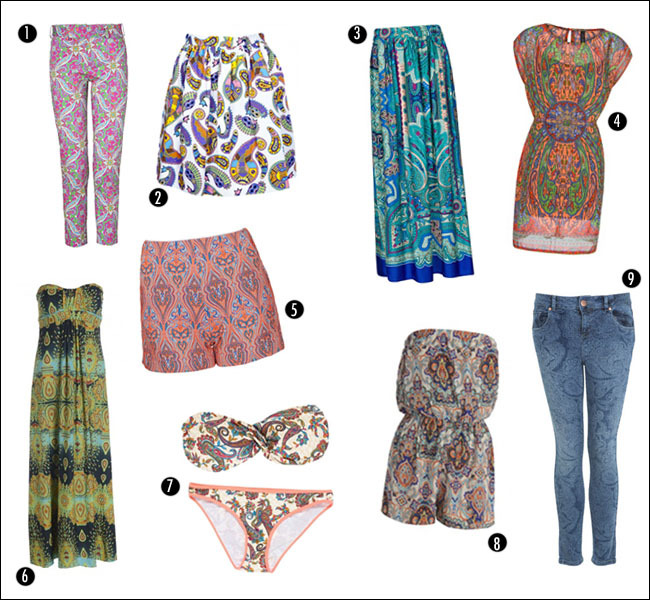 Obviously, I've created a Paisley selection for you, which is your favourite piece? Buongiorno! E' da molto tempo che non pubblico un Shop the Trend post, quindi oggi ho deciso di parlarvi della stampa Paisley/Cachemire che originaria dell'India, prende il suo nome dalla città scozzese Paisley in cui la stampa fu importata nei primi anni 90. Particolarmente in voga duranti gli anni 60, andò col tempo scomparendo per apparire solo sulle cravatte da uomo. E come tutte le mode del passato, questa inusuale stampa è prepotentemente riapparsa su abiti, pantaloni, scarpe, camicie e bikini. Fresca e divertente, se ben abbinata dona al look quel tocco boho-chic che tanto ci piace. E' però una stampa piuttosto impegnativa, quindi è raccomandabile restare neutri con gli altri capi (a meno che non vogliamo fare pendant con le tende della nonna) e più sobri con gli accessori. Come sempre, ho creato una selezione con capi e accessori Paisley; qual è il vostro pezzo preferito? the first collage I like everything so please i WANT ALL!!!! Its indeed a lovely trend. I am considering to buy a maxiskirt in that print. oh. so this is what this print is called! haha! I bought a shorts with this design. hehe. paisley intimidates me! but i love all these looks! I love this trend and I need to get more stuff in my wardrobe. mi piace molto, soprattutto sulle camicie! A me piace molto come stampa sia sui pantaloni che sulle camicie!!! Adoro questo tipo di stampa !!!!! Great roundup. The Miss Selfridge jeans are my favorite! i adore paisley. great collection above! thanks for sharing. i just found your blog and am your newest follower! Love your blog. Like all the items posted. Oh LOVE that black and white paisley jumpsuit! So beautiful! I'm new to your blog, and absolutely love it! Can't wait to see what you post next!! che bellissimo post ! Amo questa stampa ! I adore paisley! Haven't found what I'm looking for yet~ want it to be black and white for sure! Loving your blog!!! Loving the paisley print in flowy pants this spring! i have lots of paisley in my closet since i lived in india!